General Hospital (GH) spoilers tease that Drew (Billy Miller) will wrestle with his feelings. He’s torn like Sam (Kelly Monaco), but in a very different way. Sam is feeling pulled in the direction of two men at the moment. She’s in love with both Drew and Jason (Steve Burton), so that obviously presents a problem. Drew, on the other hand, is torn between what he wants and what he needs. He loves Sam with everything he has and desperately wants to be with her. However, Drew knows he needs more than half Sam’s heart. It’s just a matter of what he’s willing to accept and right now, he can’t get on board with this situation. Drew’s pain and anger are behind his latest decision. He was quite emotional after Sam confessed her love for Jason, so leaving seemed like his only option. Of course, Drew’s view could change over time. He might even start to think he was a bit hard on Sam. After all, Sam didn’t ask for any of this to happen. Jason was taken from her, so that put Sam in the position to develop feelings for his brother. Now that Jason’s back, Sam can’t help how she feels. If Sam had been taken from Drew and suddenly returned after he was with someone else, chances are good he’d be in the same boat. As Drew begins to see Sam’s perspective, he may soften a bit. General Hospital spoilers say Drew will show a gentler side on April 5. He might have a chat with someone like Curtis (Donnell Turner) and ultimately determine that he needs to talk to Sam. Could Drew want to discuss reconciling? He may decide that he’s willing to fight for Sam and their marriage. Sadly, that potential plan might not work out like Drew hopes. 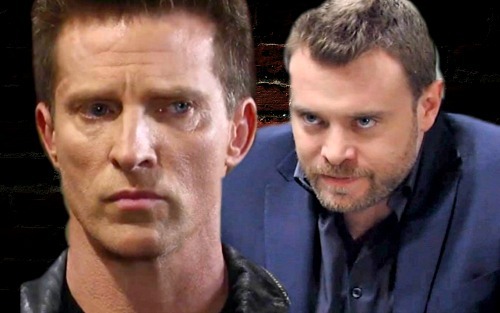 General Hospital spoilers say Drew will be rocked to the core on April 6. Will he go home and find Sam locking lips with Jason? If GH wanted things to really get ugly, Drew could find them making love! Either of these options could cause a huge setback for “Dream.” An incident like this could certainly convince Drew to file for divorce. It sounds like Drew and Sam fans have better brace for more trouble. We’ll give you updates as other GH news comes in. Stick with the ABC soap and don’t forget to check CDL often for the latest General Hospital spoilers, updates and news.